No good deed goes unpunished in this crowdfunded passion project from a trio of ex-BioWare devs. 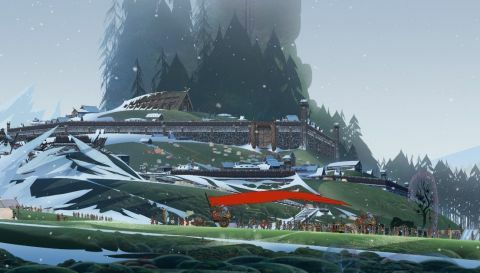 The Banner Saga is a Kickstarter game that takes the first part of the word all too literally, repeatedly laying the boot in while you're at your most vulnerable. It may ostensibly be a turn-based strategy game with light RPG elements and some Walking Dead-esque moral dilemmas, but in your slow march across an inhospitable landscape, it most often resembles The Oregon Trail. Progress is arduous, supplies are continually dwindling, and members of your caravan repeatedly cark it. The main difference between the two is that here you're more likely to contract pneumonia than dysentery. The harsh conditions it enforces are a perfect fit for this world. Stoic's semi-fantastical Norse setting is beautiful, but by golly is it bleak. "The gods are dead" are the first words you'll see as the story kicks off, and it only gets worse for your band of bedraggled heroes. The sun has gone, leaving the world in a perpetual half-light, while just about everywhere you travel is covered in a thick blanket of snow. Meanwhile, a race of armoured enemies called The Dredge are massacring anyone and everyone, forcing you to hurriedly abandon each settlement you find. People here aren't living, but surviving - and barely. Though the narrative shifts between the perspectives of a handful of characters, whoever you're currently playing is always the chief decision maker. As you guide a caravan of clansmen, fighters, and the imposing Varl - a race of horned giants who've formed an uneasy alliance with humankind - you'll see your troops trudging wearily along, a counter at the top of the screen showing the days passing by, your supplies depleting every time the number ticks upwards. Every so often, your journey will be interrupted with a text prompt, forcing you to make a decision that may or may not have a significant impact on your quest. You might have to mediate in a quarrel between unnamed clansmen, choose the punishment for a mead-stealing companion, or decide whether or not to allow your group to rest their weary limbs in a suspiciously abandoned and dilapidated village. The beauty of The Banner Saga's choices is that the consequences are unpredictable. There's no "Eyrind will remember this" here. You simply won't know at the time whether the call you're about to make will be of minor importance in the grand scheme of things, or end up having a calamitous long-term impact on your caravan. What seems like the smart choice can end up biting you on the backside, and Stoic do a devious line in misdirection. At one stage, I spent an hour or so worrying about a particularly volatile addition to the camp, only to discover that I'd been keeping an eye on the wrong man, while a later attempt to raise the morale of the party backfired horribly. And in a world where death is around every corner, it's no surprise that Stoic's scriptwriters are as quick to kill off key characters as George RR Martin. Likeable party members perish heroically (and sometimes ingloriously), while apparent cannon-fodder characters linger on. Failures can be devastating, and it's frequently tempting to reload your last save (the game periodically records your progress to allow this). And yet screwing up is kind of the point. You're not really a hero - in each case you're a reluctant leader tasked with making impossible choices under extreme pressures. The results may at times seem random, and yet its apparent capriciousness feels strangely honest. Trying to do the right thing doesn't always work out, and living with your mistakes can be hard; yet you must press on regardless. These are pretty universal truths, and it's refreshing to find a game that doesn't try to sugar-coat them. These dilemmas aren't the only interruptions to your journey. Every so often you'll be thrust into battle, tackling a selection of Dredge (or, less often, human and Varl opponents) in short, grid-based skirmishes. Select your party members - up to a maximum of six - and you'll be given a limited space to position them before it all kicks off. Then you'll take it in turns with your enemy to move a single unit, choosing whether to attack or use that character's special ability. The latter uses willpower, a finite resource that can be regained by resting for a turn, or by slaying an enemy. You can also use it to boost your movement range or increase attack power, which opens up a number of tactical possibilities. When attacking, you can opt to target a unit's armour or its strength. Armour points represent the amount of damage that can be nullified, while the strength bar also acts as a health meter. Reduce the latter and you'll debilitate them, lessening the impact of their attacks. Get it down to zero and they'll collapse dramatically to the floor. Even with fewer foes, every other turn will belong to the enemy until there's only one left, at which point you can mop up the last one standing with whichever team member you choose. Party members can only be promoted to a new level - earning two points to spend on boosting their stats each time - once they've slain enough foes, so it often pays to soften foes up with stronger party members for the less experienced units to earn the kill. It's fairly basic in concept, but there are tactical nuances to be found within. Varl fighters take up four squares, which allows you to set up a defensive barrier for archers, yet with two or three in the field, not to mention the larger variations of your statuesque foes, movement can be severely restricted. Abilities can quickly turn the tide of battle: corral enemies into a tight space and a Warhawk's Tempest attack will see them whirl their sword clockwise through the group, damaging several enemies in a single swipe. The Hunter, meanwhile, can mark his prey with a minor blow to his opponent's armour, prompting any friendly units within range to immediately launch an attack of their own. Consider, too, the Dredge's tough outer shells, which deal damage to adjacent allies when you connect with an attack - manoeuvre them into a line and the armour-piercing Thread The Needle skill can easily puncture a row of three enemies, leading to a satisfying domino effect. A pity, then, that the stakes aren't as high during combat as they are elsewhere. Surprisingly, there's no death here: what looks like a fatal blow only results in an injury to the fallen, and while you'll need to wait some days for those units to recover before they can fight again, it hardly feels like sufficient punishment for carelessness, particularly in light of the far-reaching consequences to your actions outside battle. Encounters offer a welcome challenge, but the game's need to keep narrative-crucial characters alive is somewhat at odds with its often punishing nature. It occasionally breaks its own rules, too. At one stage I'd run out of supplies entirely, having spent all my renown - The Banner Saga's all-purpose currency, used for everything from food through character promotion to equippable items - on levelling up my two archers. With morale rock bottom, and humans and Varl alike dying en route to the next settlement, I was offered an unlikely lifeline as the next narrative quandary centred on the theft of supplies. Chasing down the guilty parties, I recovered enough to make it to the next village without losing any more troops. That's among the most damning evidence of the game's budgetary constraints; that Kickstarter cash can only fund so much, after all. There are signs elsewhere, too: it's a shame to see character models repeating, particularly when your most recent recruit ends up firing arrows at an enemy doppelganger. And while the Bakshi and Bluth-inspired art is strikingly beautiful, the static dialogue sequences can feel a little flat, no matter how good the writing is - and happily, it's very good, with just the right dose of dry, gallows humour. Still, however much of the money went to Austin Wintory, the investment was worth it. Rich, evocative and laden with portent and melancholy, the soundtrack is more than a match for the majesty of the environments. Indeed, there's a certain quiet grace to your party's march across the parallax-scrolling wastes, dwarfed by the world they inhabit and the enormity of their situation. These non-playable sequences give you time to reflect on events, on decisions you've made and allies you've lost, while conveying both the passage of time and the sense of journey in a more convincing manner than almost any other game. Perhaps that's Stoic's most remarkable feat of all: this saga may be over within a dozen or so hours, yet it still has the weight and feel of an epic.